Liberto Organic Protein Shake at Bodybuilding.com - Best Prices on Organic Protein Shake! 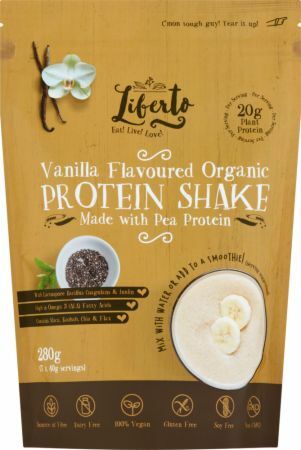 Say hello to our range of delicious organic & vegan pea protein shakes, without whey, from Liberto. Liberto's organic & vegan nutrition boosting protein shakes are not only a great way to increase your daily intake of protein but are also a tasty, delicious option for those embracing a healthy, active lifestyle. What's more, with baobab, chia, flax, lactospore bacillus coagulans and inulin all in the mix, this is a super shake for a super you! No Organic Protein Shake Reviews Found. Pea Protein (69%)*, Omega 3 Blend* (Milled Flax Seed*, Milled Chia Seed*) (11%), Natural Vanilla Flavouring (5%), Coconut Palm Sugar*, Baobab*, Maca*, Acacia Gum*, Konjac*, Inulin*, Lactospore Bacillus Coagulans. Directions For Organic Protein Shake: Mix 40g of product with 250ml of water or your favourite milk alternative, e.g. oat or almond. Shake vigorously for 10-15 seconds. Alternatively, blend into your favourite smoothie or sprinkle over your morning cereal. Store in a cool, dry place. Once opened, consume within 3 months. Produced in Ireland. Lavida Food Ltd, The H.E.A.C. Moylish Park, V94 E8YF Limerick, Ireland.